Grandmothers and mothers were keeping the kids fed, not man the hunter. 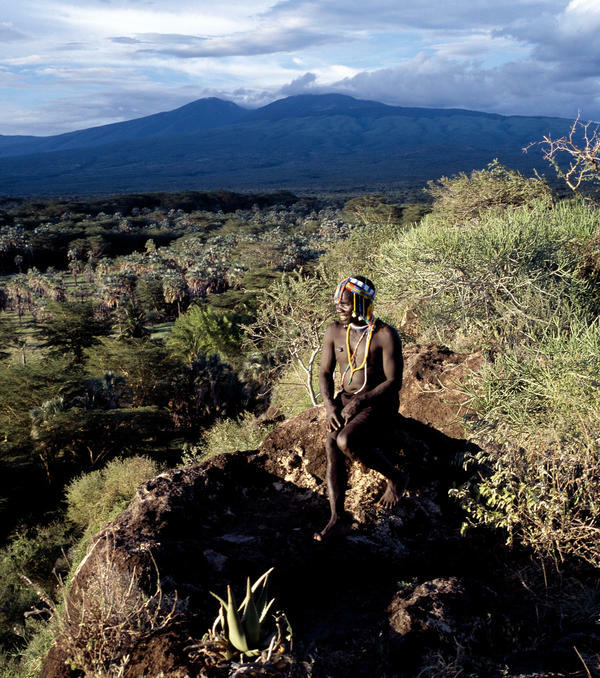 A Hadza hunter in Tanzania. Researchers have looked at the hunting success of the Hadza and found that they bagged an animal on 3.4 percent of their excursions. 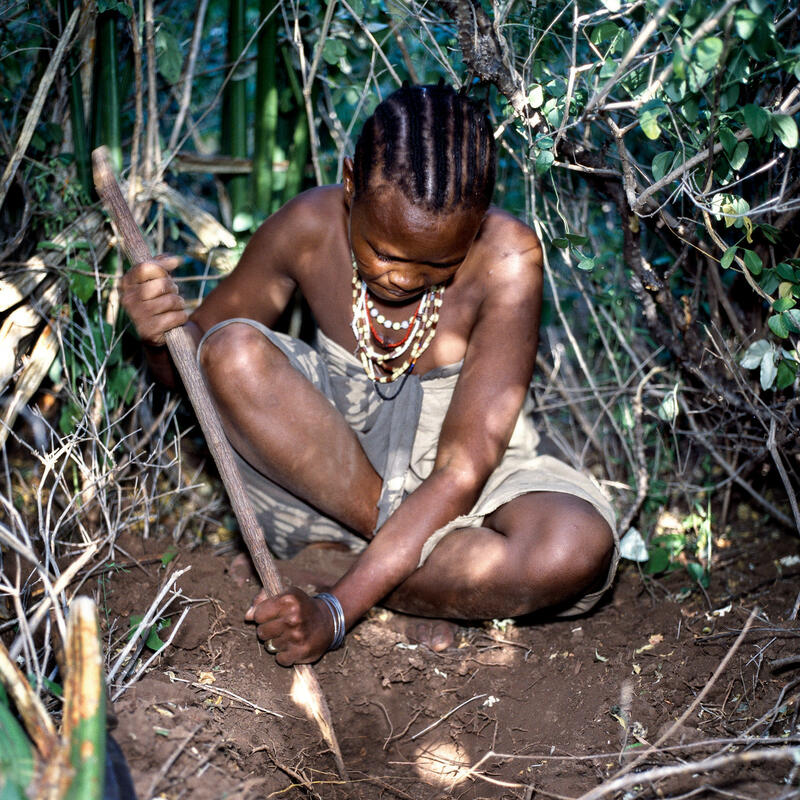 A Hadza woman digs for tubers with a digging stick. 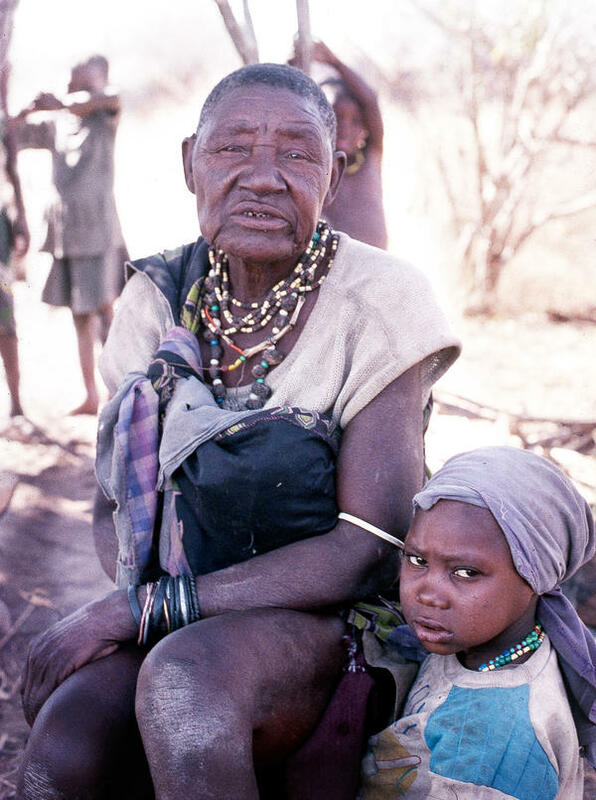 A Tanzanian Hadza grandmother sits in the shade with her grandchild during the 1995 dry season. A hunter with bow and arrow, in a steamy sub-Saharan savanna, stalks a big, exotic animal. After killing and butchering it, he and his hunt-mates bring it back to their families and celebrate. This enduring scenario is probably what many of us have stuck in our heads about how early humans lived. It's an image with drama and danger. And it happens to coincide with Western ideas about the division of labor and the nuclear family that were prevalent in the 1960s when this so-called "Man the Hunter" theory first emerged. A newer body of research and theory, much of it created by women, has conjured a very different scenario. It probably looks a little more like a quirky indie film than a Hollywood blockbuster. The star of this new film? Grandma. Kristen Hawkes is an anthropologist at the University of Utah. She tries to figure out our past by studying modern hunter-gatherers like the Hadza, who likely have lived in the area that is now northern Tanzania for thousands of years. Groups like this are about as close as we can get to seeing how our early human ancestors might have lived. Over many extended field visits, Hawkes and her colleagues kept track of how much food a wide sample of Hadza community members were bringing home. She says that when they tracked the success rates of individual men, "they almost always failed to get a big animal." They found that the average hunter went out pretty much every day and was successful on exactly 3.4 percent of those excursions. That meant that, in this society at least, the hunting hypothesis seemed way off the mark. If people here were depending on wild meat to survive, they would starve. So if dad wasn't bringing home the bacon, who was? After spending a lot of time with the women on their daily foraging trips, the researchers were surprised to discover that the women, both young and old, were providing the majority of calories to their families and group-mates. She describes this finding as "mind-blowing." In this foraging society, it turns out, grandmothers were more important to child survival than fathers. Mom and grandma were keeping the kids fed. Not Man the Hunter. Sarah Hrdy is a primatologist at U.C. Davis who also studies connections between child-rearing and human evolution. She has spent a lot of time thinking and writing about a related topic. She says, "An ape that produced such costly, costly slow-maturing offspring as we have could not have evolved unless mothers had a lot of help." First among these helpers, she thinks, would have been grandma – likely joined eventually by many other new helpers, who could have included fathers, aunts, uncles and siblings. If young kids were being fed by people besides mom, she thinks that over evolutionary time, this could have led humans to develop the deep social orientation that characterizes our species – to care so much about the thoughts and intentions of other people. She says, "People often try to explain the fact that humans are so good at cooperating by saying, well, we needed to cooperate in order to succeed at big game hunting, or so that men in one group could bond with other men to go wipe out the neighboring group. What that doesn't do is explain why these traits emerge so early." She's talking about babies and the advanced social traits that we can see even before they begin walking – like pointing, sharing and paying attention to social cues like smiling and frowning. From the standpoint of a human baby, this caregiving situation is very different than for any other species of great ape child. Baby chimpanzees, bonobos, orangutans and gorillas are all cared for exclusively by mom. And these primate moms are extremely protective of their babies — sometimes not even letting another ape touch the baby for months after birth. For human babies though, other human adults are usually present right at, or shortly after, birth — first helping the mother and then later helping and feeding the baby. We are the only great ape species that does this. Human babies, Hrdy argues, have an incentive to care about what other people are doing and thinking and feeling in a way that other apes don't. Knowing who might help and who might hurt, and learning how to appeal to the former, might be the difference between eating well or going hungry – maybe even the difference between life and death in some cases. Michael Tomasello is a developmental psychologist at Duke University and the Max Planck Institute. After a career of comparing cognitive differences between babies and apes, he has found that other apes don't show anywhere near the level of interest in the sharing and cooperative behaviors that emerge so early in humans: "Humans as individuals aren't that much cleverer than other apes. It's the fact that we can put our heads together with others and communicate and collaborate and learn from others and teach others. Human children are adapted for cooperation and shared intentionality in ways that apes aren't." Tomasello originally assumed that the pro-social traits seen in human babies were preparing kids for skills they'd need as adults, in line with the Man the Hunter hypothesis. Now he thinks that Hrdy's proposal – that human babies are so socially oriented as a result of shared child care and feeding – is a more compelling theory. The traits appear so early in a human's life that it makes better sense that they were adapted to early childhood situations rather than adult hunting behaviors. It's this ability to "put our heads together," as Tomasello puts it, that may have allowed humans to survive, thrive and spread across the globe. 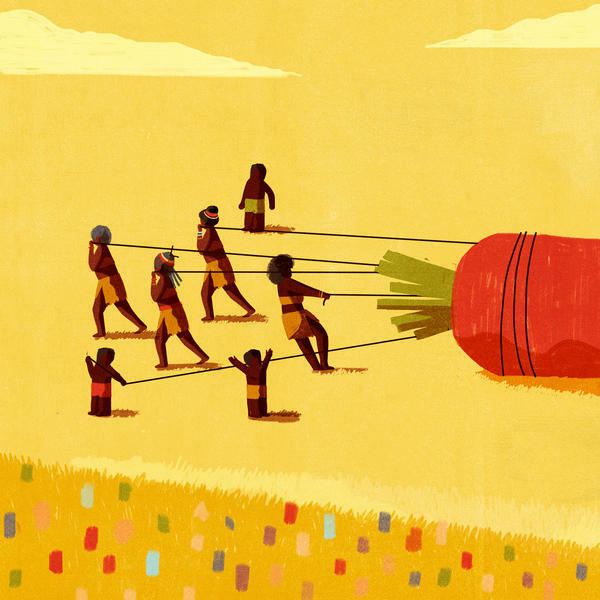 While the men were out hunting, grandmothers and babies were building the foundation of our species' success – sharing food, cooperating on more and more complex levels and developing new social relationships. In a nutshell, humanity's success may all be dependent on the unique way our ancestors raised their kids. Thanks, Grandma. Man the hunter, the classic hypothesis is that men hunting to feed mates and offspring was a quintessential step in the evolution of our species. 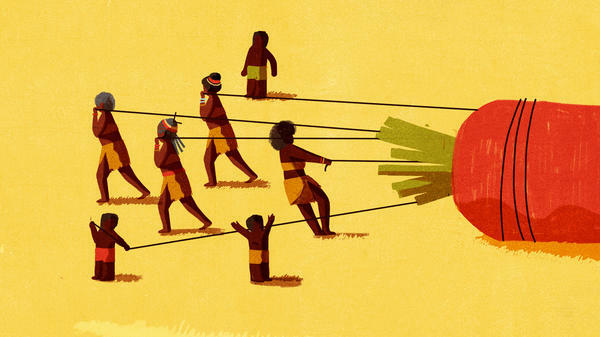 Some think it may have led to group cooperation, advanced tool use and extra protein to fuel bigger brains. A newer theory claims that what made us human might have had less to do with men out hunting and a lot more to do with what was going on at home. 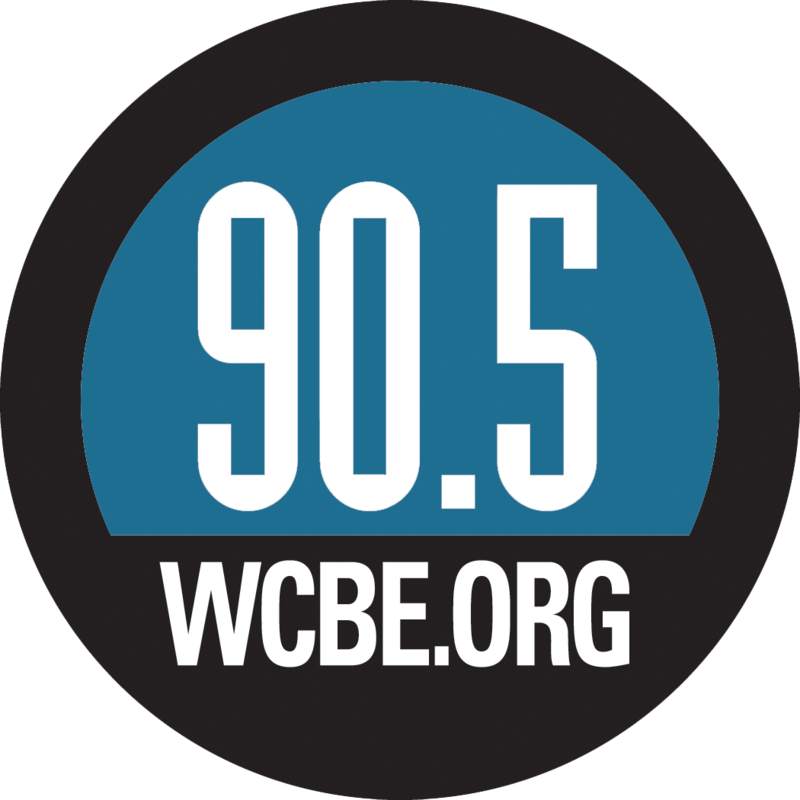 As part of an NPR-wide series, How to Raise a Human, NPR's John Poole explains. JOHN POOLE, BYLINE: Kristen Hawkes is an anthropologist at the University of Utah. She tries to figure out our past by studying modern hunter gatherers, like the Hadza, who live in the East African savanna. Groups like this are about as close as we can get to seeing how our early human ancestors might have lived. KRISTEN HAWKES: So here's an opportunity to see, well, OK, here are people living on wild foods with all these big animals that they're hunting. And so let's see what happens. HAWKES: They almost always failed to get a big animal. The average hunter was successful 3.4 percent of the days. HAWKES: Well, if the kids were relying on this for dinner tonight, they'd be in trouble night after night after night after night after night after night. POOLE: So if Dad wasn't bringing home the bacon, who was? The women. For starters, mom was keeping the family fed by digging tubers. Food is scarce in these savannas and how successful she was at gathering correlated with how big her kid was, until she had another baby. HAWKES: And then that relationship went away and then the correlation was with their grandmothers. POOLE: Which must have been kind of mind-blowing. POOLE: Mom and Grandma were keeping the kids fed, not man the hunter. Sarah Hrdy is a primatologist at UC Davis, who also studies connections between child rearing and human evolution. SARAH HRDY: An ape that produced such costly, costly, slow-maturing offspring as we have could not have evolved unless mothers had had a lot of help. POOLE: Hrdy says there was another big change happening on the home front. If young kids were being fed by people besides mom, she thinks over evolutionary time, this is what led humans to be so socially oriented, to care so much about the thoughts and intentions of other people. HRDY: People often try to explain the fact that humans are so good at cooperating by saying, well, we needed to cooperate in order to succeed at big game hunting or we needed to cooperate so that men in one group could bond with other men to go wipe out the neighboring group. What that doesn't do is explain why these traits emerge so early. POOLE: She's talking about advanced social traits that we can see even before babies begin walking, like pointing, sharing, paying attention to social cues like smiling and frowning. MICHAEL TOMASELLO: And then when I thought about it more, I thought, well, wait a minute, you know, why are these little kids doing this? POOLE: That's Michael Tomasello. He's a developmental psychologist at Duke University in the Max Planck Institute. He originally assumed this early social orientation was preparing kids for skills they'd need as adults, following the man the hunter theory. But after years of comparing cognitive differences between babies and apes, he agrees that these cooperative traits could have evolved to help babies adapt to having multiple caregivers. Tomasello says other apes don't show anywhere near the level of interest in the sharing behaviors that emerge so early in humans. TOMASELLO: Humans as individuals aren't that much cleverer than other apes. It's the fact that we can put our heads together with others and communicate and collaborate and learn from others and teach others. Human children are adapted for cooperation and shared intentionality in ways that apes aren't. POOLE: It's this ability to put our heads together that may have allowed humans to survive, thrive and spread across the globe. While the men were out hunting, grandmothers and babies were sharing food, cooperating and developing new social relationships, perhaps building the foundations of our species' success. John Poole, NPR News. Transcript provided by NPR, Copyright NPR.